Good stuff. I'm looking forward to the next part. Being a former RC, and having discussed these issues with RC's I've been through some of this before--but this arrangement of the info is more comprehensive--and useful. Historically speaking, it wasn't until the medieval period that the bishops of Rome considered themselves as "pope" and "supreme pontiff" over other bishops. It is historical revisionism to claim every bishop of Rome was "pope" since that title and belief was a late development in the church. The New Testament does not allow for a lordship of one apostle over another, insisting that the keys of the kingdom were given to all apostles equally(Matthew 18:17-20), that such a heirachy may operate in the world system but not in the kingdom of heaven(Matthew 20:25-26). The word in the English "you" can be understood in the singular or plural, depending upon the context. In the Greek in Matthew 18 it is the plural form. The heart of Roman Catholicism is the papacy. One topic I want to discuss further goes along these lines: The Rc notion that the Church preceeds Scripture. As Father John O'Brien has said, the Church "is not the child of the Bible, as many non-Catholics imagine, but its mother. She derives neither her existence nor her teaching authority from the New Testament. She had both before the New Testament was born: she secured her being, her teachings, her authority directly from Jesus Christ." This is a beginning presupposition- it is a faith claim, and needs to be explored. Any sect can claim to be the true church of Christ. Mormons as well as the Roman church make such assertions. Merely making such a claim doesn’t logically make it true. The reason I know the Mormon claims are false is based upon Holy Scripture. This is exactly the same way I know that the Roman institution with the papacy and magesterial claims are false. The Scriptures are the only way I know what the church of Christ actually is. Without the Scriptures I have no logical method of discerning truth from error. The Scriptures clearly tell us that the church(ecclesia) of Christ is the true Israel of God, a continuation of believers throughout history who cleaved to the promises of God, especially the Messiah/Christ. Hence, the true church is located wherever the believers are. 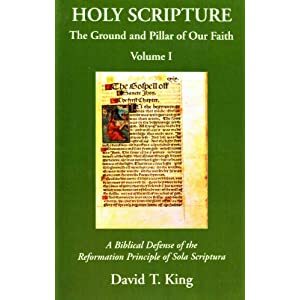 This includes all Christian sects and even many heterodox organizations where people still retain faith in the true God as revealed in Scripture, contrary to the heretical teachings of their sects. The Roman claim that without that heiarchical organization we had no way of discerning truth from error is totally illogical. The religious leaders in Israel during the time of Christ had no idea that the Israel of God, the church, was not identical with the ethnic nation of Israel until the Holy Spirit made it crystal clear to Paul(Romans 9:6ff). Hence, the true church of Christ is invisible to the naked eye,although wherever people gather together to worship Christ in Word and Sacrament we have a glimpse of the communion of saints. However, because not all members of the Christian community are believers,many being hypocrites, only at the consummation of the ages will the true church be visible to the world(Col 3:4)..